I’m glad that I had a sharpening session directly on my temporary workbench, before I finished (or even started, ahem) my “real” bench. 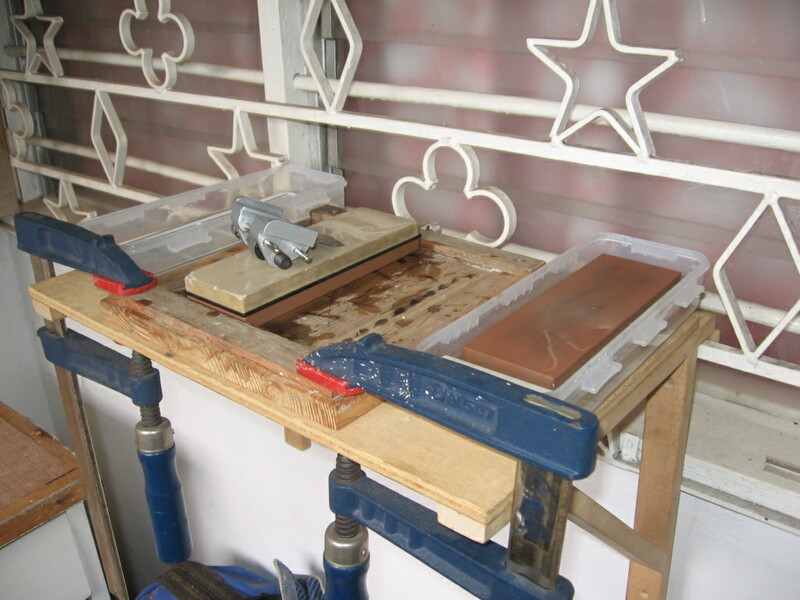 After a while, the water and slurry started to fly, and the amount that sloshed over my simple little sharpening stone base would have given me a fit over my nice workbench surface. Time for a dedicated sharpening station. But with a 6×8 shop, I’m hesitant to “dedicate” space for anything outside of my bench. Fortunately, the shop has a big huge windowed area that is covered by a big huge grate (this used to be the external wall when the house was first built). I’ve learned to put that grate to good use, and will likely use a lot more of it as I go along. Here you can see what I’ve got set up there so far: a C-clamp rack, a torpedo level mount and two shelves made from scrap. I screwed little blocks onto the back of the shelf brackets, and that’s what’s holding them on. I can just lift up and pull them right off or move them higher or lower. And here is a closer look at my new sharpening station. Soon, I’ll mount some short dowels underneath the base that will slide into matching holes on the shelf. That way I can use the shelf for other things until it’s sharpening time again. 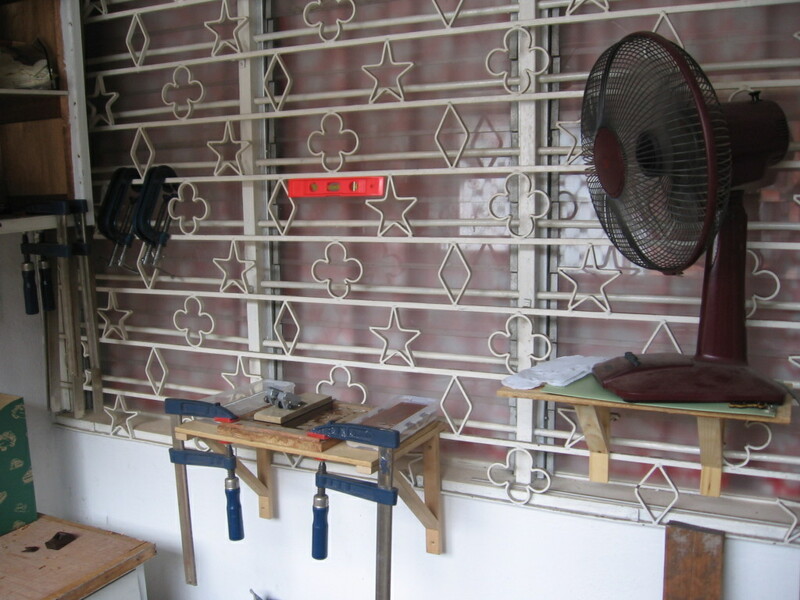 But the shelf is plenty sturdy during sharpening – no movement whatsoever! It will make a world of difference in your ability to handle and cut wood, and it functions well as a mini-bench not just for cutting but for chopping mortices and the like, and just for contemplating the mysteries of craftsmanship :). I would definitely do this before attempting to build a regular bench. I enjoy your blog; keep up the good work! I do have a bunch of 2x4s that I’m too intimidated to try to flatten at this point for my benchtop, so maybe I’ll take up this diversion first! Appreciate your encouragement Pete. Have a good one! This really makes me appreciate the space I have in my shop! You’re doing a great job in customizing your workspace.